When you're working out, it's important to give your body the fuel it needs—both before and after your workout. If you're planning to do any cardiovascular activity, try drinking a carbohydrate-rich smoothie 30 minutes to 2 hours before the activity. After you finish exercising, eat again to refuel and help your muscles repair. A postworkout smoothie should include carbohydrates along with a protein punch, which can increase muscle synthesis. Here are a few pre- and postworkout smoothies to make your workout more effective. Preworkout Sunny Side Up 1½ c orange juice 1 banana 2 tbsp wheat germ 1 c mango chunks, frozen 1 c pineapple chunks, frozen Add ingredients to FourSide or WildSide+ jar in order listed and secure lid. Select "Smoothie" and drink up. 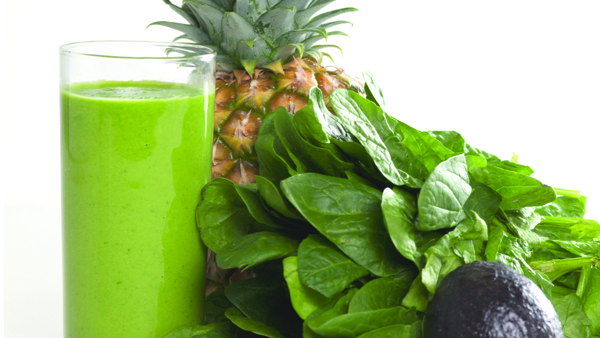 Green Pineapple Paradise ¾ c water 2 c pineapple chunks 1/2 medium ripe avocado, peeled and pitted 2 c spinach ½ c ice cubes Add ingredients to FourSide or WildSide+ jar in order listed and secure lid. Select "Smoothie" and drink up. Green Pineapple Paradise Postworkout Protein Power Crunch ¾ c milk ¼ c hemp granola 1 banana 1 scoop whey protein 1 c ice Add ingredients to FourSide or WildSide+ jar in order listed and secure lid. Select "Ice Crush" and drink up. Chocolate Peanut Butter Blast 1 c water 2 tbsp peanut butter ¼ c oats 1 scoop chocolate whey protein ¼ c ice Add ingredients to FourSide or WildSide+ jar in order listed and secure lid. Select "Ice Crush" and drink up. What are your favorite pre- and postworkout smoothies?